Vintage - Cris D'Arques/Durand, Cut Crystal Cordial Glasses, Set of (6) Six, Multi-Sided Stemmed, Made in France, Circa 1968. We are offering a Set of (6) Six, Stemmed, Cut Crystal Cordial Glasses, made in France, of French Crystal by Cris D'Arques Durand. In the Beautiful "Chantilly/ Taille/ Beaugency" Pattern having a Fan, Diamond and Star Cut Bowl, on Multi-Sided Stem, and a plain "uncut" Foot. A very striking pattern which is no longer produced. It also has exceptional Crystal Ring Sound. Great Condition. 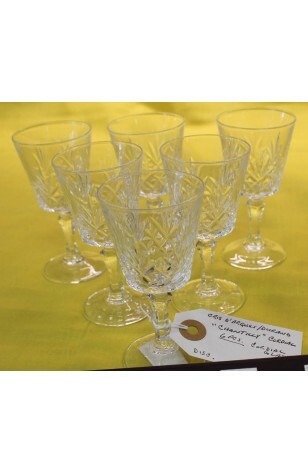 We are offering a Set of (6) Six, Stemmed, Cut Crystal Cordial Glasses, made in France, of French Crystal by Cris D'Arques Durand. In the Beautiful "Chantilly/ Taille/ Beaugency" Pattern having a Fan, Diamond and Star Cut Bowl, on Multi-Sided Stem, and a plain "uncut" Foot. A very striking pattern which is no longer produced. It also has exceptional Crystal Ring Sound. Very Good Resale Condition unless noted below or seen in pictures.